Pakalert Press » Zetatalk: India Will Become South Pole: 1.3 Billion Driven Under Waves? India and the surrounding countries will not fare so well. India has 17.5% of the world’s population, or 1.3 billion, and will be driven under the waves to become the new S Pole. The surrounding countries of Bangladesh, Vietnam, Thailand, Burma, Nepal, Sri lanka, Cambodia, Pakistan and Afghanistan will likewise have polar temperatures or sinking and their populations thus not expected to survive. Are these people ready to become Eskimos? Thus India and its surrounding countries, comprising in total some 26.5% of the world’s population, will perish unless they move prior to or shortly after the Pole Shift. After the hour of the shift, Pakistan will find itself with a higher elevation above sea level, more ocean access as India to the east will be underwater, and additional ocean access from what we anticipate to be an inland bay cause by the ripping and sinking of the Eurasian Plate just to the west of Pakistan. Bone chilling cold will be the largest danger after the shift, as Pakistan will be literally within the polar circle. Take a clue from the Eskimos in how to dress and build homes, and take to fishing the oceans as a way of life. Nepal rides the Himalayas, close enough to India, the new South Pole, to expect a climate not unlike Greenland or the Bearing Strait after the shift. Add to this its elevation, which will only increase due to the subducting of the Indio-Australian plate under the Himalayas, and the cold will be more intense. Thus, all in Nepal who do not move inland after the shift will freeze. If nearly half the world’s population lives in China or India and its surrounding countries, what of the rest of the world? The Americas are relatively sparsely populated, with N America (including Canada and Mexico) holding about 6.5% of the world’s population and S America (including Central America and the Caribbean) holding another 6.7%. 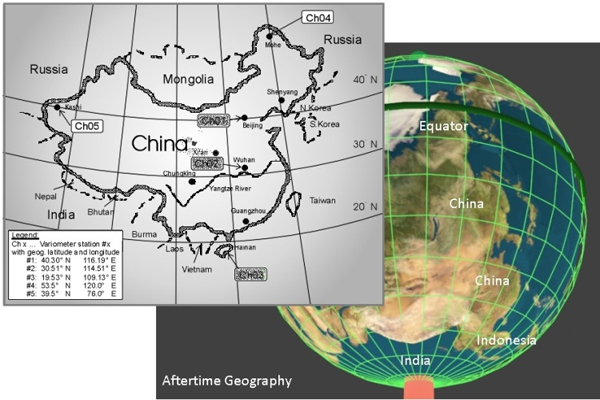 Both these continents will continue to have temperate climates in the Aftertime, though both will sustain Aftertime flooding. Used to the tropics, those survivors living close to the Bulge of Brazil will be shocked to find themselves shivering, as their homeland moves from a subtropical land to land within a polar region. Those well inland, in lands well above the backwash that the Amazon might experience during torrid rains and sloshing seas, will find their climate more moderate, hardly changing at all from what they experienced in the past. All of Canada fares well during the coming pole shift, and depending upon its altitude will fare better after the pole shift than before, due to the climate changes. Canada in the main is not criss-crossed with earthquake faults of active volcanoes, and thus suffers less from the direct effects of earthquakes and exploding volcanoes during the pole shift. Due to the shifting crust, most surviving Canadians will also find themselves in a warmer climate too. Canada will be positioned above the equator in a temperate zone after the pole shift, in a wamer strata than at present. Africa has it all – good Aftertime climate, high land that will not be flooded, but (unfortunately) indigenous Ebola. Africa is relatively underpopulated, with only about 12% of the world’s population. Beyond S Africa getting a lot of interest from the wealthy, there does not seem to be overt interest for the Aftertime in Africa. The entire African continent, with the exception of some coastal areas or deep river valley’s, will remain above sea level even after the poles have melted. This would seem to place it in an enviable situation, especially in light of the moderate temperate climate the entire continent will enjoy in the new geography. This must be balanced by special circumstance Africa struggles with, which will become worse before they get better. Plagues similar to the Ebola virus will spread, under the influence of the continuous rains and drizzle that run for decades after the shift, to all parts of Africa, stopped only by the seashore. The Ebola virus and its cousins live in swamps, passed among the creatures that live there, and these creatures will find all of Africa to their liking during this continuous wet season. Eskimos are found at the north pole, as are polar bears. Get your directions straight so that you sound at least a little bit believable.